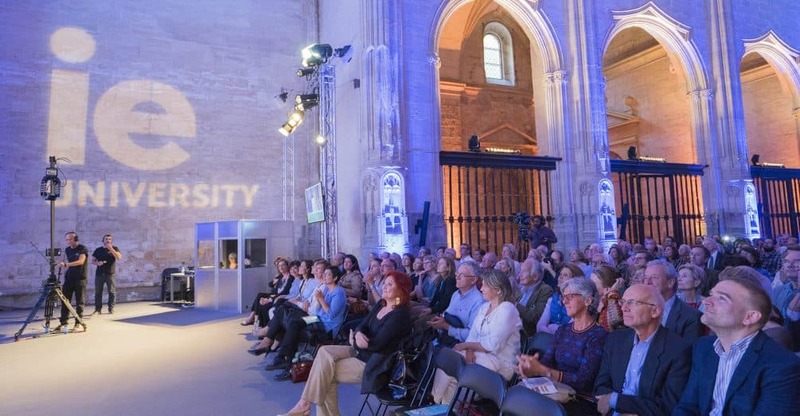 Spain’s biggest ideas event, the Hay Festival, celebrates its thirteenth edition in Segovia this September, in which IE University, thanks to the support of the IE Foundation, is once again the main collaborator and academic partner. “Open your mind and imagine the world” is the motto of the XIII Hay Festival, which will run until September 23 and will host some 200 professionals who will take part in debates, conversations, concerts and exhibitions of the visual arts, which will be developed in various stages of the UNESCO World Heritage city in central Spain. The 2018 edition of the Hay Festival will address the future of Europe. “The words ‘coexistence’ and ‘Europe’ are part of one of the themes running through this edition of the Festival, which emphasizes the idea of culture as a link in Europe,” said Maria Sheila Cremaschi, director of Hay Festival Segovia. The campus of Santa Cruz la Real, home of IE University, will host some of the most significant events; creators of international prestige will visit the university to participate in this international festival. The events on campus will be developed in five spaces: the Magna Aula, Refectory, Sala Capitular, Student Hub and Media Lab. Among the leading names from literature, art, architecture and journalism taking part this year will be Paolo Vasile, Ken Follett, Anthony Beevor, Hanif Kureishi, Stephen Frears, Peter Florence, Paul Preston, Simon Schama, Concha Barrigos, Catherine Nixey, María Teresa Fernández de la Vega, Nativel Preciado, Miriam González, Enrique Barón Crespo, Martha Thorne and Santiago Iñiguez, President of IE University, among others. Also taking part will be AC Grayling, Hannah Collins, William Kingswood, Kayuzo Sejima, Walter Mariotti, Lars Lerup, Scott Hartley, Luis Rojas-Marcos, Stefan Baron, Fernando Fernández, Sam Wilkin, Cristina Manzano, Raphael Minder, Isabel Coixet, Guillermo de la Dehesa, Saul Craviotto, Marta Garcáa-Aller and Teresa Baca. Among other highlights will be two panels co-organized with FT Weekend and moderated by Tony Barber, Europe Editor of FT and Frederick Studemann, Literary Editor of FT. In 1987, in Hay-on-Wye, a small town on the border between England and Wales that is home to 1,500 people and two dozen bookstores, two local residents, Peter Florence (current director) and his father Norman, decided to hold a festival literary. Since then, Hay has grown to become one of the most important ideas festivals in the world, attracting hundreds of thousands of people each year. The Hay Festival, with a presence in Europe and Latin America, is chaired by the actor and writer Stephen Fry, and its board of directors is headed by Caroline Michel. During the last decade, Segovia has captured the original spirit of the Hay Festival thanks to its director Sheila Cremaschi, attracting more than 20,000 visitors and turning the city into a national and international cultural reference point.